Should I use heat or ice on my back for pain? Heat or Ice? for my back. About twice a week, a new patient gets out of their car with white knuckles wrapped around the door sill while trying to keep their back straight and every facial muscle tenses with a pail complexion of fear. After 5 minutes of this limbo la process, they slowly creep into the office. When I come out to greet the patient, they’re standing in dread of sitting or another limbo la process is needed to extract themselves from the chair. Without asking, I know that this patient hurt themselves and most likely started using the “soothing sirens song” of heat and now they are experiencing “being dashed on the rocks” by using heat on their spine. Heat on a new spinal injury is like putting gasoline on a fire, nothing good can come of it. “But my friends PT (physical therapist) said she could use heat” – you have to understand the chronology of that statement before you use it. Mary Jo first saw her PT between 21-28 days after the injury, now its chronic. If the PT had seen her in the 0-14 days, ice should have been the recommendation. Heat in the first 14 days after an injury can increase your pain and duration of the pain up to three times greater. 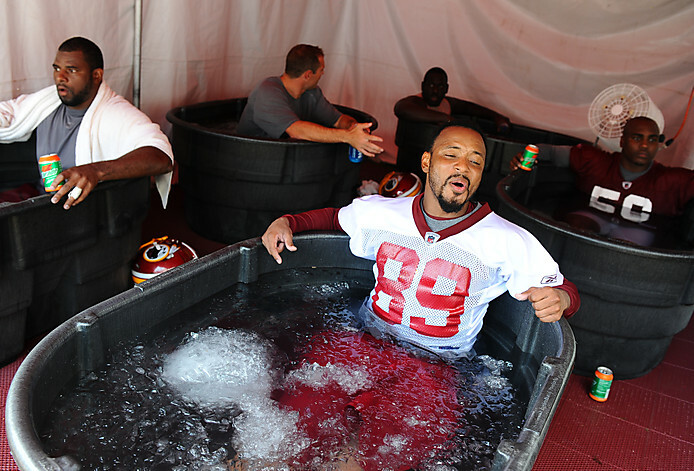 NFL teams are using ice baths for their athletes after every competition and practice. Please remember “Ice is Nice” – cold provides pain relief and also reduces swelling by reducing blood flow to the injured area. When icing injuries, never apply ice directly to the skin. Have a damp terry cloth between your skin and the ice bag and never leave ice on an injury for more than 30 minutes at a time, then leave it off long enough for the skin to re-warm, usually 30 minutes. Longer exposure can damage your skin and even result in frostbite. When you get an injury, do you put ice or heat on the injury? What’s your answer?